In the storied battle for Adventureland ice cream supremacy, my flag is firmly planted in the Citrus Swirl column. I appreciate that everyone has different tastes that resonate with them, but there is something that I prefer in the slightly bitter, yet very sweet swirl that the Dole Whip just doesn’t have. While the Dole Whip is a longtime staple of both Disneyland and the Magic Kingdom, the tumultuous history of the Citrus Swirl also keeps me interested. There is, however, one thing that until recently the Dole Whip had that the Citrus Swirl did not, a float version of the concoction. Earlier this year the Sunshine Tree Terrace rolled out the Citrus Swirl Float, the same ice cream treat you know and love, orange concentrate (or orange juice slush if you prefer) and vanilla soft serve, served in a glass of orange soda. Comparing it with the original cup Citrus Swirl, you do appear to get more of the ice cream and orange slush combination in the glass along with the orange soda. I’ll be the first to admit that I was excited by the prospect of a float version of the treat, but the use of a carbonated soda confused me a bit. However, once I tried it I was pleasantly surprised. Ice cream in Florida is always going to be an eat quickly or watch it melt and slump off onto the pavement, and the Citrus Swirl Float is no exception. Except now you have the added level of as the ice cream sinks into the glass there is also soda leaking out over the side. So let’s just say the stickiness factor on this one is ramped up. Depending on how much of the soda you get with your bite of Citrus Swirl will also depend on what orange flavor you get, the more authentic citrus flavor that comes from the swirl itself or the artificially enhanced version of an orange from the soda. I do appreciate the orange soda ice crystals that form a crust around the ice cream as a fun way to play with my food. Overall, the addition of the orange soda is something that I could take or leave, but I am definitely glad to have the option. 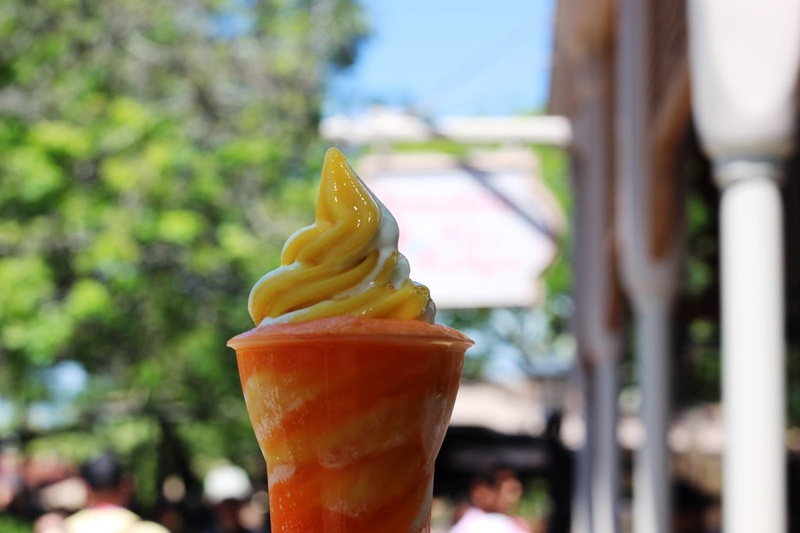 The Citrus Swirl Float doesn’t necessarily level the playing field between the Swirl and the Dole Whip, but it does provide one more option in the host of ice cream offerings throughout the parks. I do like how it feels as if I am getting more of the orange slush and vanilla soft serve in the float, and for that reason alone I will likely add it into my regular Citrus Swirl rotation. I'm with you, the citrus swirl is my absolute favorite!